1. Clean and heat grill on high heat. 2. Slice pineapple into 1/4" slices. 3. Place on pineapple on grill for 5 minutes or until grill marks start to appear. Then flip over and cook for another 5 minutes. 4. Remove pineapple from grill and slice into small pieces. 5. Place 1 scoop of vanilla ice cream bowl. Then pineapple pieces. 6. Crumble some graham crackers over bowl and sprinkle coconut pieces over the top. 7. 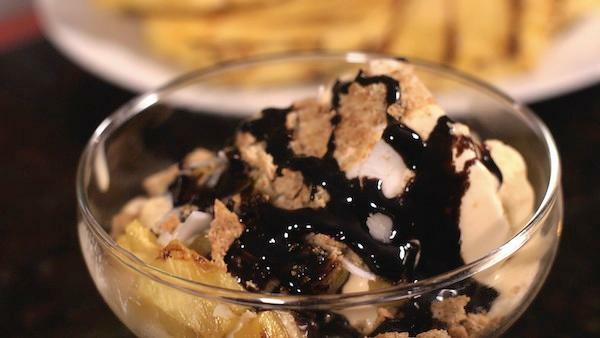 Drizzle with chocolate syrup and serve.